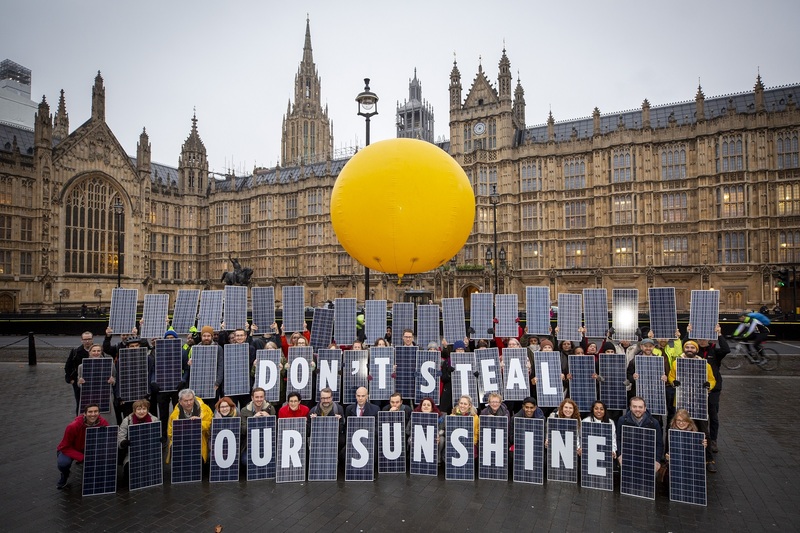 MPs joined protestors to create a pop-up solar installation in Westminster, formed using makeshift solar panels and a 10ft inflatable sun. The protest, led by activism group 10:10 Climate Action, were joined by campaigners from the Solar Trade Association, UK Youth Climate Action, the National Farmers Union and Community Energy England, all calling for the government to rethink plans to axe the export tariff for new solar installs. She was joined by fellow Conservative MP Tim Loughton, who described the planned cut as a “double kick in the teeth” for homes, schools and other public bodies. “Expecting these public institutions to act contrary to what big energy producers are doing is adding insult to injury. This is no way to encourage people to extend the transition to renewable energy which the government has strongly supported and our planet desperately needs,” he said. Meanwhile, the Home Insulation & Energy Systems (HIES) assured contractors scheme confirmed that it had met with shadow energy and climate change minister Alan Whitehead to deliver the results of a survey of its membership, which highlighted the potential damage the end of the export tariff could have on the small-scale renewables scheme. Whitehead, who has been a vociferous campaigner for the export tariff from the despatch box, said that he “cannot think of a better way to discourage people” from investing in solar than culling export tariff payments. “When we talk about the export tariff, we are not talking about a subsidy. We are talking about a payment for goods supplied. Call off talk of removing the export tariff and get on with using that tariff to support future subsidy-free solar investment,” he said. Last month, energy and clean growth minister Claire Perry appeared to signal a government U-turn on the proposals, telling ministers it would be “wrong” to ask solar owners to provide power to the grid for free. That U-turn has yet to be confirmed however, with an official response to the consultation yet to be published.